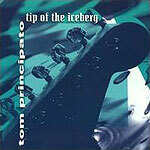 CD review: "Tip of the Iceberg"
A star of the East coast raodhouse circuit, ace guitarist Tom Principato just keeps getting better and better. On his latest release, he continues his approach to the blues of crossing influences from George Thorogood to Stevie Ray Vaughan. While long a respected guitarist, on this new album, he shows that his abilities at composing, arranging and producing are nearly as impressive. It's his most polished effort yet, and just about any fan of guitar-based blues and blues/rock should enjoy it.